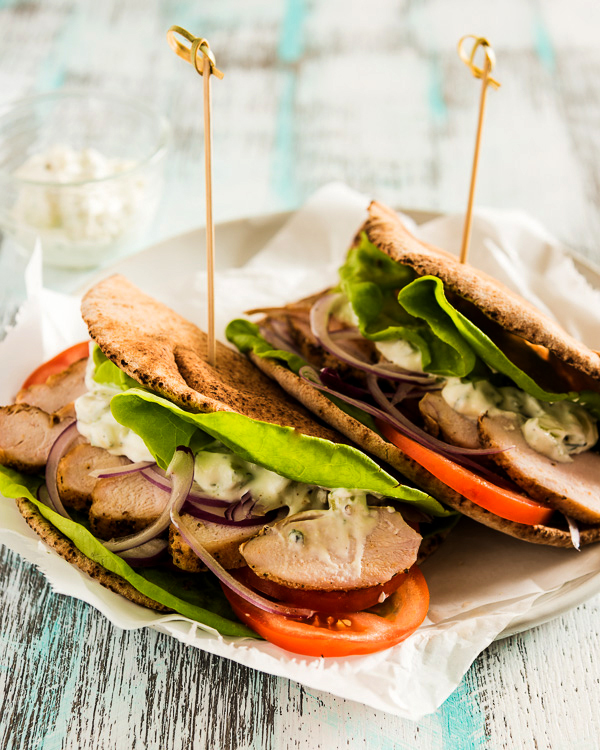 Slow cooker chicken gyros are a great choice for a healthy, nourishing, and delicious weekday dinner. You can prepare everything ahead of time. Assembly takes 10 just minutes! Creating authentic tasting gyros takes some effort, but all the tasks can be done beforehand. In fact, you will want to make the tzatziki sauce a few hours before serving, so it will give the spices plenty of time to combine. It will result in a more balanced sauce. Make sure you mix the sauce right after starting your slow cooker. This way you’ll have everything ready when the chicken is done. We love cooking chicken in the slow cooker, because it makes it flavorful and juicy. In this recipe, I include a tip to create a crispy crust in 5 minutes with a skillet, just like on roasted chicken. I like to use this method especially when I’m making the chicken a day ahead and need to heat it up before serving. Or when I use a skin-on cut. By briefly grilling the chicken in a skillet, not only will it crisp up the skin (or the surface), it will also heat up the chicken gently without drying it out. To make the most delicious gyros, you should use fresh pita bread and vegetables. If you’re too busy to shop for fresh ingredients, though, we have another solution. We tried using frozen pita bread, heating it up in the oven just before serving. The texture and flavor were just as nice. You can use canned whole tomatoes to replace the fresh ones. 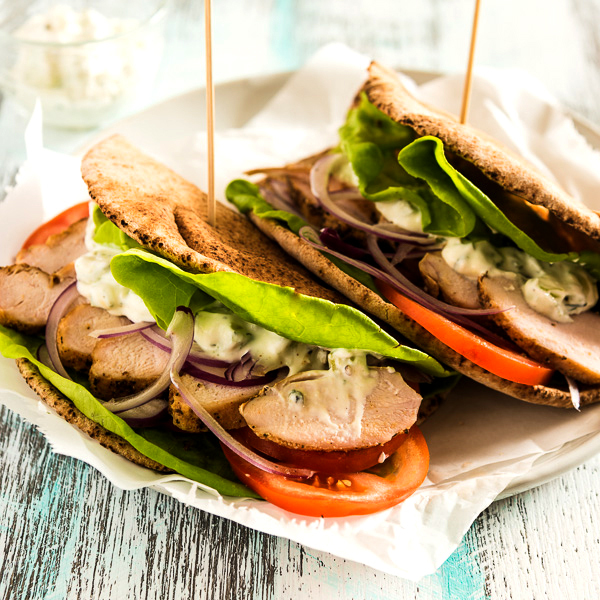 If you do not have fresh lettuce, simply cut a few more slices of cucumber and add them into the gyros. See, creating fresh and delicious gyros is not difficult at all! Combine garlic, lemon juice, oil, vinegar, seasoning, and salt in a small bowl. Whisk until mixed well. Pour into a slow cooker. Add chicken breasts. Use a spatula to coat the chicken with the liquid seasoning. Cover and cook on low heat for 4-6 hours. Prepare the tzatziki sauce while the chicken is cooking. Combine cucumber and a pinch of salt in a bowl. Stir to mix well. Let rest for 10 minutes to drain moisture. Transfer the cucumber onto a few pieces of cheesecloth (or a paper towel). Squeeze to remove as much excess moisture as possible. Transfer the cucumber to a medium bowl. Add yogurt, garlic, vinegar, lemon juice, and dill into the bowl with cucumber. Season with salt and pepper to taste. Stir to mix well. Cover with plastic wrap. Let sit in fridge for at least 30 minutes, up to overnight, before serving, to let the flavors blend evenly. When the chicken is cooked, you can serve it immediately or brown it in a skillet. To make your chicken even more flavorful, lightly grind salt and pepper onto both sides (without cutting it), and cook with a tablespoon of oil in a skillet to brown the surface. If you’re using a cut with skin on, this process will create crispy skin. Transfer onto a cutting board and slice it into bite size. Layer warm pitas with lettuce, tomato, chicken, and red onion. Pour tzatziki sauce on top. Serve with lemon wedges.